Who did you help today? This is an interesting interview with John Wayne, from 1975. It is interesting because what he says in directly applicable to current events. The Duke speaks to the tactics used by liberals then and still in use today. Yes, John Wayne is something of a hero for me. Yes, John Wayne wasn’t his real name; the audio is important for what he says, not necessarily who is saying it. LANGUAGE WARNING, the audio contains some swears and curses that may not be appropriate for children. The audio is from TonyMacklin.net, the interview took place in 1975. The complete interview can be heard here. Your Mind is giving up. Defeat is easy. There are always a million excuses lying around for you to grab onto. We typically defeat ourselves, but that moment before we allow defeat there is an opportunity to be better than you are. Face it your mind wants to give up before my body does, all you need to do is utter the phrase…I can’t… Be better than you are, say yes I can, instead and tough it out. This applies during Training, on the Mat or in Life. Often we forget why we practice so much. When that happens we become complacent and that is when bad things happen. To often we think we can put off our training until tomorrow. We practice today so we are prepared today, not tomorrow when it might be to late. Well almost anything. Let us remember this is a quote from a movie. And not a very good movie either starring Ben Affleck. Regardless the quote bares further contemplation. Everyone is afraid of something, unless they are insane. Some are afraid of the dark, some water, some spiders or snakes. Even the most fearless warrior is afraid of something, even if he never shows it. There is a difference between being afraid and appearing afraid. Each has its place. Fear is a normal response to things that are new, unexpected or we have been conditioned to fear. I’ll admit it, I am afraid of spiders. My fear stems from being forced, by my parents, into a spiderweb filled storage crawl space under my childhood home 2-3 times a year. I had to crawl into the 3 foot high, dirt floor space a good 4 feet to reach the chain on the light. There were spiders everywhere. Even though I know where my fear comes from and I can mostly control it, and I understand spiders aren’t usually the bad guys, the fear is still there. You won’t know it if you throw one in my lap, but my pulse will elevate! There you have it, boil it all down and fear is a decision. Following the Sept 11th attack on the World Trade Centers, many of the people trapped in the buildings chose not to be afraid of what they knew was about to happen. Instead a few of them called loved ones to share a final moment, one such caller was described as calm. I am sure others were consumed by fear, for themselves or their loved ones. None of us can say with honesty or certainty how we would react in a similar situation. We react to fear based on the situation, on our state of mind, on so many factors, but if we train to control our fears beginning in the sparring ring we will be better equip to face and handle our fears when they catch us unaware. If you are a person of faith I would add fear, like worry, is a lack of faith. Being busy does not always mean real work. Given the measure of accomplishments Thomas Edison made in his lifetime his words bear listening to, in every arena of your life. Many of us are simply robots going through the motions of life, busy like bees in a hive, yet what do we accomplish? We approach everything in this manner. We workout for 22 minutes because that is what someone told us, no forethought, no real goals. Take a moment today and think about what you want to accomplish, meaning figure out what your goals are. Look at how you are going to do this (system and planning). Make sure your system and plan make sense, not a pie-in-the-sky unintelligent plan but one that is realistic. Be honest with yourself and your abilities. It doesn’t take that long to go through these steps! Now all you need to add is perspiration! the man who wants to live is the man in whom life is abundant. To often we let life get us down. In our state of sadness we squander the time life has given us. Imagine that you are given the last hot dog on the planet and instead of savoring it (and perhaps sharing it) instead you complained because you did not have any mustard! What a waste! Perhaps you have been blind your entire life and given the gift of sight for a day you complain that the Sun is to bright, instead of soaking in the beauty of a rose. We are given these type of gifts every day but they are common to us so we take them for granted. How foolish we are to shroud our Spirit in sadness instead of joy. Spoiled, we loose sight of the gifts around us. Every moment is a gift, how many moments have you wasted? If you dwell on the answer to that question then you have learned nothing at all. 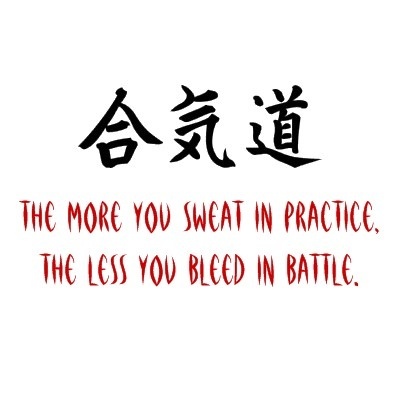 Now that may not seem to apply to the Martial Arts but I hope you will find that it actually does. When we begin to train in the Martial Arts there is nothing beautiful about it! We are awkward because we lack understanding and knowledge, we lack experience necessary to perform the basic movements of the Martial Arts. Our mind and body do not have Unity, they both resist in relinquishing control to you, the student. The more you practice the more Unity you gain, things begin to become natural and flow. If you stop your training there, you have accomplished much and it will serve you well in every aspect of your life. But you will be lacking. As we continue to train the Unity of our practice becomes comfortable and smooth, but is missing something. With continued training you will begin to experience moments of epiphany when you see the Truth of your perfect execution and the True uses of that particular technique. You will even see the Truth of using a particular technique in ways you were never taught. You will feel confidence and power swell in a type of calm pride. If you stop your training at this point you will be a formidable opponent who can handle most situations that would call for Martial Arts skills. But you would still be lacking. Because at this point you have only seen the partial truth of your training. You have the Truth of each technique but you have yet to assemble them to their true ending. Goodness. This training part of your training is difficult to be taught, because you feel your training is complete. Your physical training is, but we are more than physical beings and the Martial Arts at every point recognizes that. I will try to explain this next step in your training, most ignore it, few understand what they seek, and fewer discover it (I am not professing that I have). Goodness comes from the picture and feeling of the Unity and Truth you have gained. The Goodness comes from understanding that all your training, all your sweat was not leading where you thought. You thought you were training to be a Master Warrior near indestructible! Instead you start to see the Goodness, the Truth the Unity that in training and honing your body and mind to fight, you no longer desire to. You seek Justice through peace not strength or will or power of what you could do. Rather your skill and power is only meant to be used in a reflective manner, defensive only. If you stop your training here, you have much to teach the world of students who await you. 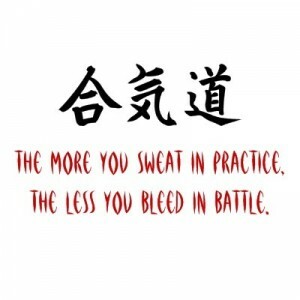 This is the secret of the Martial Arts that most have forgotten or chosen to ignore for a multitude of reasons. Live in Peace (Goodness). Live in Awareness (Truth). Live at Peace with yourself (Unity). You will be the calm, unmovable Stone at the center of a raging river of life. In life we are told and taught to be prepared. Mark Twain’s quote states the obvious, no one knowingly gets up in front of a crowd to speak without preparing! We prepare for everything from presentation to disasters. But what about Karate? Do you prepare to defend yourself? Honestly, the best you can do is practice and practice some more. Because unlike a test or a speech, a fight is dynamic, you must rely on instinct and the skills you have practice and hope they are enough. I guess that is the reality we don’t like to admit, you can never be to prepared and you will never know if you are prepared enough! Some would take that as license to never prepare, which of course is pure folly. Some will try to prepare for every possible situation, again pure folly, since I am pretty sure the chances are pretty small I will be fighting a bus load of midget ninja’s any time soon! The moral of the story is prepare, train, but relax. If you are training well, when the time comes you will handle any situation with a grace and skill, that will surely surprise you; since I guarantee, you will not have trained or prepared for the situation you encounter! The Martial Way begins and ends with courtesy, therefore, be properly and genuinely courteous at all times. Following the Martial Way is like scaling a cliff – continue upwards without rest. It demands absolute and unfaltering devotion to the task at hand. Strive to seize the initiative in all things, all the time guarding against actions stemming from selfish animosity or thoughtlessness. Even for the Martial Artist, the place of money cannot be ignored, yet one should be careful never to become attached to it. 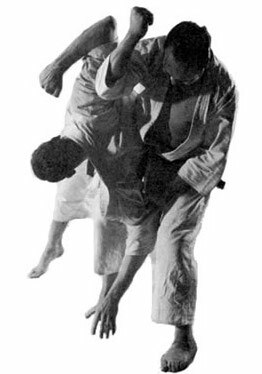 The Martial Way is centred in posture. Strive to maintain correct posture at all times. The Martial Way begins with one thousand days and is mastered after ten thousand days of training. In the Martial Arts, introspection begets wisdom. Always see contemplation on your actions as an opportunity to improve. The nature and purpose of the Martial Way is universal. All selfish desires should be roasted in the tempering fires of hard training. The Martial Arts begins with a point and end in a circle. Straight lines stem from this principle. The true essence of the Martial Way can only be realized through experience. Knowing this, learn never to fear its demands. Always remember: In the Martial Arts the rewards of a confident and grateful heart are truly abundant. Benjamin Spatz on The First Kyokushin Karate Dojo in Denver ! Martial Thoughts copyright © 2005-2014, Theme(Ink and wash) Design By Arne.